Well, can you believe it's only a week or so and it will be February already? My time sense is really skewed at the moment and I'm having trouble believing that Christmas was only a few weeks ago... It seems like an absolute age, while at the same time I don't seem to be moving forward. Christmas was good, quiet and uneventful, which was exactly what I needed. Due to feeling rather ill, exhausted and suffering a general lack of mojo over the past few months, I didn't give any hand made gifts this year. Other than the Humungous Doily of course, which was finished before my mojo departed for warmer climes and was greatfully received by my mother. Knowing I wasn't feeling up to it and could barely find the energy to knit a few stitches, I even warned those who might expect such presents not to expect any... Then I relented and I knitted two presents. I think my mistake was to knit two of the same pattern, both in manly colours (i.e. dull, boring, grey and so, so, mind numbing) as the intended recipients were of the male persuasion. 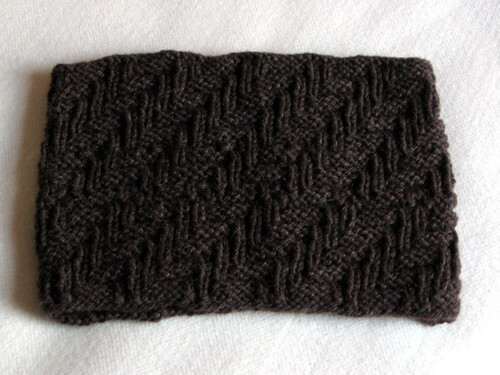 The pattern in question was the Darkside Cowl (Ravelry Link) by Sara Fama. Please don't get me wrong, there was nothing wrong with the pattern and I think the resulting cowls turned out very well, but knitting the same 16 row repeat, over and over for two man sized cowls, just about did for my flagging mojo. In fact by the time I was half way through the second one, I could only manage one row at a time before I started yawning. By the second row, I'd be nodding over my needles - which is not at all condusive to following a pattern. In fact, I'm yawning now just recalling how I felt knitting these up, which is just not a good sign. So mental note to self - this Cowl in a dark, manly yarn is not a good choice if your mojo is waning and should be paired with some other projects on the needles at the same time. Preferably something bright, colourful and not manly. Here is Darkside Cowl number one. I finished this one at the end of November but I refrained from blogging my eventual success because I immediately cast on number two which was intended for a regular reader of this blog. Now I'd intended to give it as a Christmas present, but no matter how I tried couldn't knit more than two rows in any one session and so I finally cast off about two weeks ago. No photo's as of yet because it has only just been washed... But I will post a shot once I have one. The yarn here was Patons UK Wool Blend Aran picked up from Busy Fingers in Coventry. It's a high wool content (63%) yarn and Dave said it smelled very sheepy when I was working on it, which may not have helped in garnering my enthusiasm for the project. The only modification I made to the pattern was to add eight stitches to the round, making a total of 96 stitches at cast on. 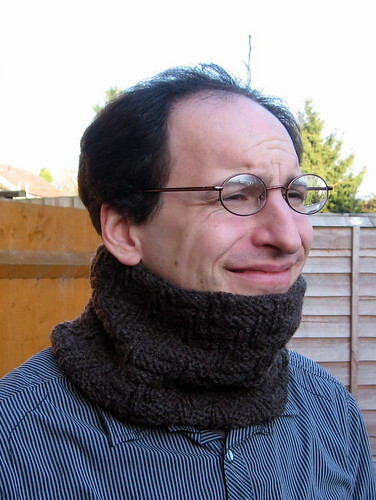 Dave wasn't convinced when I explained what a cowl was and I don't think he thought a lot of the finished article, at first anyway. Dave is a traditional sort of a man and a scarf wearer of long standing. Then the weather turned cold, snow started to fall and Dave discovered he could wear a cowl just about anywhere, doing just about anything. Now, this cowl is usually either around his neck or somewhere close to hand, so I think he's been converted. He did say though, that he's feeling guilty for no longer wearing the scarf I made for him for Christmas two years ago.